The Caribbean coast of Costa Rica is a beautiful region that is generally less developed and touristy than the Pacific side. The weather here is in stark contrast to the other side as the best weather is in September and October. The colorful Caribbean culture is also quite different as most locals are of Afro-Caribbean decent giving the area a reggae-Rasta vibe. Puerto Viejo, a surf oriented seaside village, is the most popular destination in this region and is located along the southern coast. Playa Cahuita is a popular destination for those seeking quiet jungle-lined beaches. 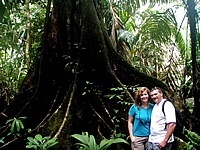 Tortuguero is located on the northern Caribbean coast within Tortuguero National Park. It is one of the best wildlife observation areas in the country and a primary nesting location for Atlantic Green Sea Turtles from mid-July through mid-October. Click on the links below to read more about the Costa Rica Caribbean side. Until recently, Puerto Viejo has remained one of Costa Rica’s best kept secrets. This fun little Caribbean surf side pueblo is quickly becoming a popular destination for those seeking an alternative to the more touristy Pacific side. This area is definitely not for all, but perfect for some. The beaches here are stunningly beautiful and there are many restaurants, bars and shops to enjoy between excursions and beach time. Located on the southern Caribbean coast, Cahuita is a peaceful fishing village. Cahuita is best known for the national park, which protects coral reefs just off the beach and the rainforest in front of it. The quiet village is spread out, but has a variety of small souvenir shops and restaurants. 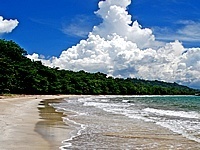 Punta Uva is located along the southern Caribbean coast between Puerto Viejo and Manzanillo. This is one of the most beautiful, yet least visited beaches in Costa Rica. 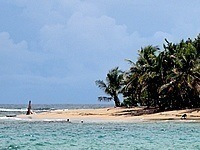 The immaculate white sand beaches are excellent for swimming and bordered by scenic palm trees. Diving and snorkeling are great at certain times of the year in the reef in front of the beach. Tortuguero is a popular destination for eco-tourists in search of wildlife and nesting sea turtles within the national park. The town is positioned on a narrow strip of land between the lagoon and Playa Tortuguero. The beach, though pretty, is not a good swimming beach as there is a high concentration of sharks, large waves and dangerous riptides.